You clean your lenses or case with water. 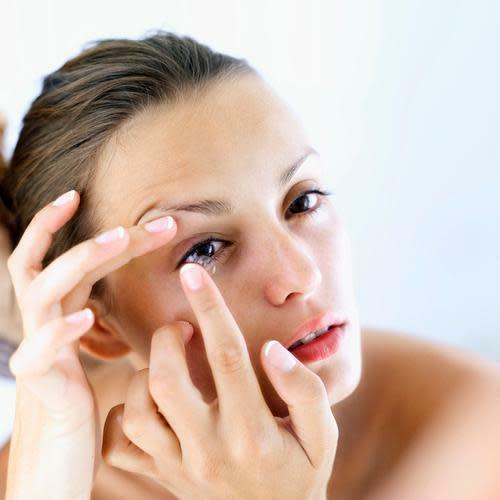 “A lot of people are not aware that you’re not able to wash contact lenses in water,” Vivian Phan, senior optometrist at UCLA’s Jules Stein Eye Institute, told Yahoo Health. In fact, water can cause soft contact lenses to change shape, swell and stick to the eye, according to the CDC. This can lead to the contact lens scratching the cornea, giving germs easy access to your eye where they can cause an infection. Contact lenses should also never be worn while swimming, showering or in a hot tub, and cases should never be washed in water. “You should clean out your case with fresh contact lens solution, wipe it out and let it dry completely, upside-down,” says Phan. You top off the old solution in your lens case with new solution. You may think there’s no harm in adding some new contact lens solution to the old solution in your lens case, but you’d be wrong. “This causes the disinfectant to lose its effectiveness,” Elmer Tu, M.D., spokesperson for theAmerican Academy for Ophthalmology and professor of clinical ophthalmology at University of Illinois at Chicago, told Yahoo Health. “Change the solution every day,” he says. You don’t clean out your lens case after each use.Every single time you use your contact lens case, you need to rinse it out with fresh solution and let it dry, notes Phan. Is it a hassle? Sure. But “otherwise, a little layer will build up on bottom called biofilm,” explains Phan — and that could put your eyes at risk for infection. You’ve had the same contact lens case for a year. 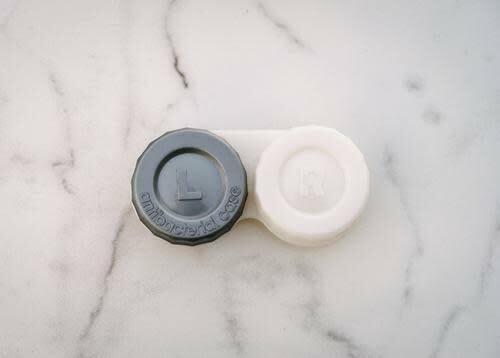 In most cases, being frugal and loyal is a good thing — but not when it comes to your contact lens case. You should replace your case every three months, according to Phan. “The No. 1 cause of infection is having a dirty case,” she says. In fact, research shows that not replacing your case in six months increases your risk of moderate to severe microbial keratitis by more than fivefold.